A Crested Butte resident, Brittany Walker Konsella is an explorer and adventurer at heart. 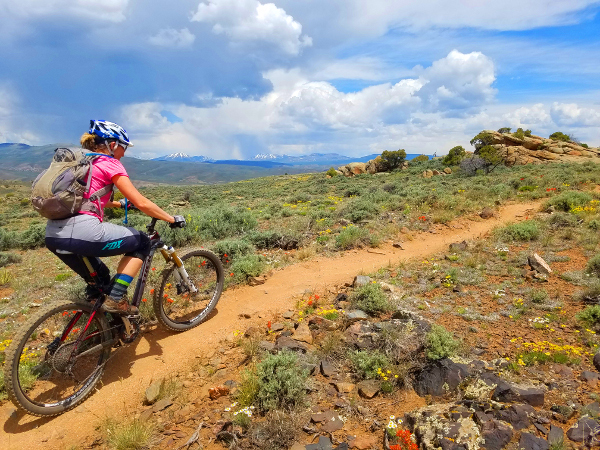 She became the second woman to ski all of Colorado’s fourteen-thousand foot peaks in 2011 so it was only natural for her to be drawn into the TrailQuest Challenge. In 2017, Brittany co-authored Backcountry Ski and Snowboard Routes: Colorado with her husband, Frank Konsella. Brittany continues to build her life around exploring and experiencing the outdoors through hiking, mountain biking, and skiing and she writes about those experiences on 14erskiers.com. 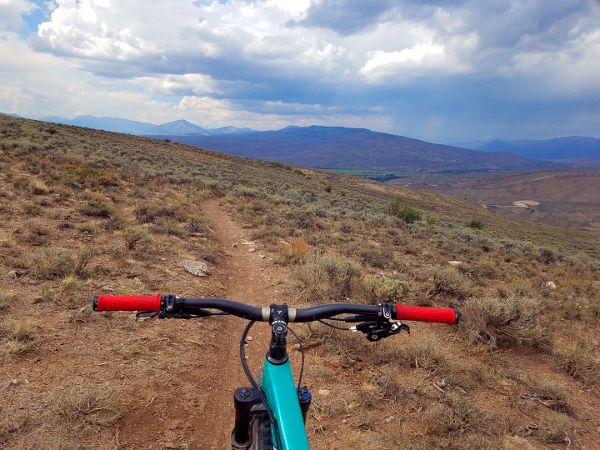 As the seasons change and the riding becomes less and less appealing in Crested Butte due to rain and snow, we begin to focus on mountain biking in the desert. 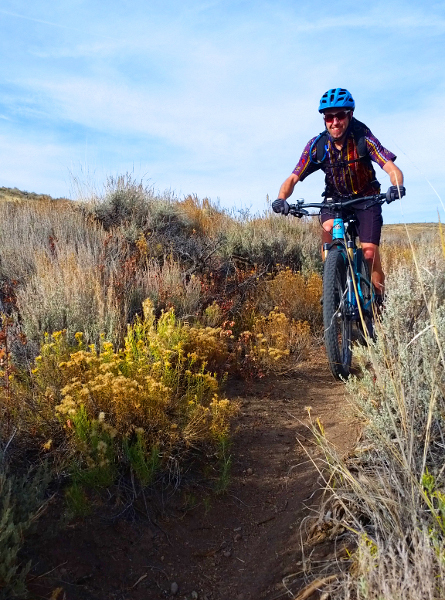 When Coloradans think about “desert riding”, Fruita or Moab are two of the main areas that first come to mind. But, Gunnison has its own share of desert riding which can easily rival these aforementioned destinations. In terms of TrailQuest, the Gunnison region is geographically one of the smallest of the contest. The northern boundary lies a couple of miles south of Almont, the southern and western boundaries stretch enough to just squeeze in all of the Hartman Rocks Recreation Area, and the eastern boundary meets the edge of the Fossil Ridge Recreation area. 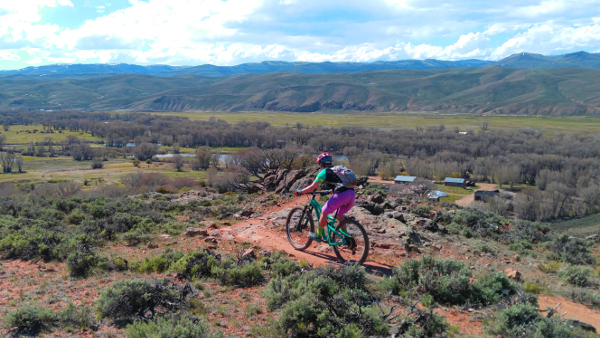 Essentially, the two main places for riding in the Gunnison region are Hartman Rocks and Signal Peak. Though both Signal Peak and Hartman Rocks are managed by the BLM, both offer different high desert experiences. Located just northeast of Western Colorado University, Signal Peak refers to a mass of foothills that lead their way up to the Sawatch Range. This diverse area has some sparse pine and aspen, surrounded by a lot of sage. The soil tends to be very loose and gravely and sometimes contains larger loose rock. 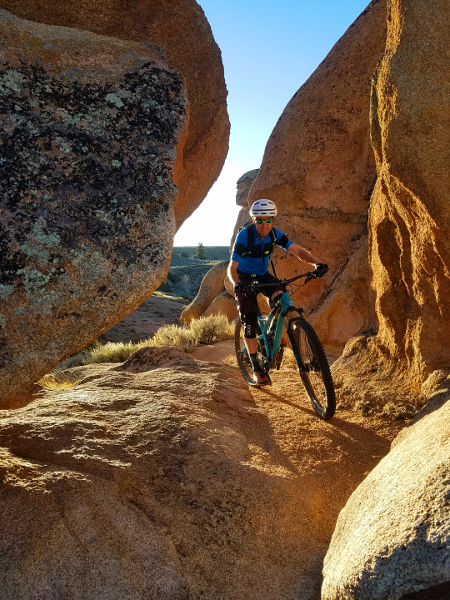 The terrain at Hartman Rocks, on the other hand, is a bit more similar to what people envision when they talk about “desert riding” – lots of sandy soil with fun granite features to ride over from time to time. Hartman’s is also covered in sage, with occasional aspen in the mix. The riding in both areas is top notch. I especially like to ride in these areas during the shoulder seasons. But, they also make great alternatives in the summer on cooler days or when it might be raining elsewhere. With a network that consists of over 40 miles of trails, the Hartman Rocks Recreation Area truly offers something for everyone. 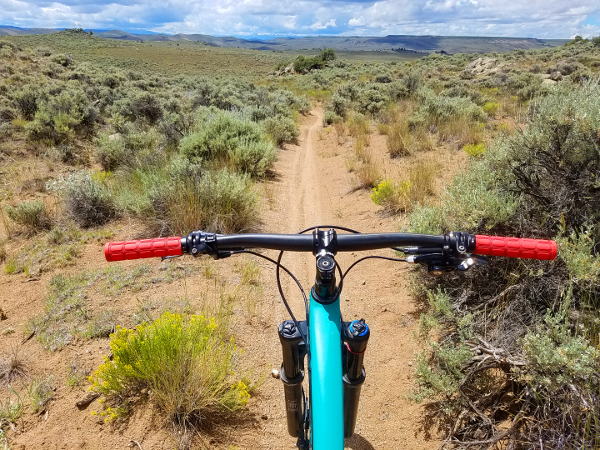 Newer travelers to this area often have difficulty navigating their best way through this maze of mountain biking trails. 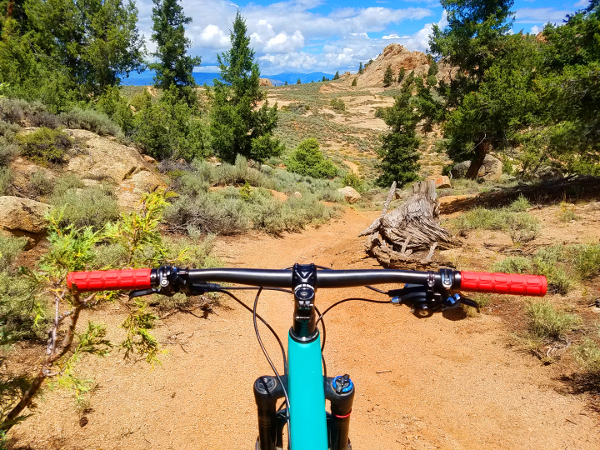 In this article, I have included two different riding options to give newer visitors to the area a good feel for what Hartman Rocks truly has to offer. One of my favorite loops that gives a great overview of Hartman Rocks is a link-up of many of the northern trails into a figure 8 loop. To do this loop, start at the main Hartman Rocks parking area off County Road 38. You ascend Jack’s Trail until its end. Then follow Hartman Rocks Road southwest and then west until the start of Behind the Rocks. Ride that trail west until its end on a road. A quick left on this right will take you to Alonzo’s where you will continue to ride west. Alonzo’s ends on the Golf Course Overlook Rd 3545a. Take this south to the start of Graceland. Ride this counter clockwise (a shorter option would be to take High Fives to Cat’s Cradle to Graceland) until it ends at the start of Gateway. The other trails were fun, but Gateway is where the real fun starts! Ride Gateway in the eastward direction until it intersects with Josies. Then ride Josies south. This trail is fast and fun in this direction, and will descend into a valley. At the end, you will need to head east and you can do this either on Rd 3500 or on the Buddy Bear Trail. Follow Luge trail through the sage as it heads north. The very end of it is called Lower Luge. Take Luge to its end and you will notice that you are where you started on the Graceland Trail – at the waist of the figure 8! For the finishing miles, continue up the Golf Course Overlook Rd 3545a past Alonzos to the start of Top of the World. Head east on this trail as it winds around through many fun rock features. This links up directly with The Ridge, where you will continue to travel west. Then follow the short Tail Pipe Trail to its end. From there, descend Collarbone, which starts at the same cattle gate where you exited Jacks earlier in the ride. This figure 8 loop is easy to shorten when needed! Just take a look at the map on the CBGTrails app to help you make your shortening decisions! The different regions of Hartman Rocks are fun to explore even on their own. 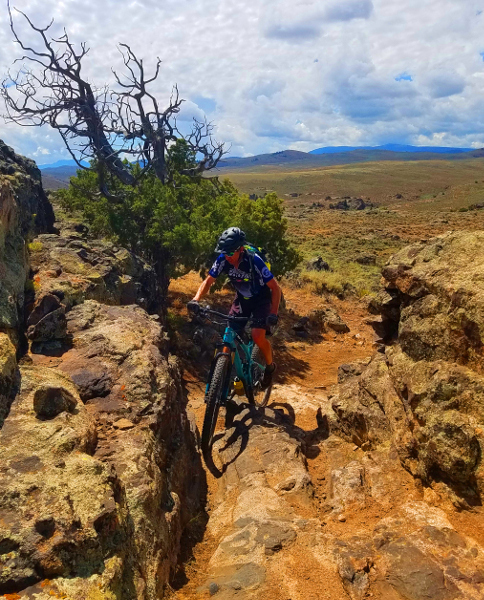 Some of the best riding occurs in the middle portions of the recreation area, which curiously has both some of the most technical riding and some of the easiest riding. The following loop gives a great overview of the eastern middle trails at Hartman Rocks. Park at the Bambi’s trailhead, which is located a couple of miles south of the main Hartman Rocks parking area on County Road 38. Climb up Bambi’s, which takes you through a scenic drainage and over some fun technical rock features. Once you climb out of the drainage, the trail will begin heading north. Look for the trail sign for Sawtooth, which is also full of some fun technical lines. This trail returns to Bambi’s at the end. Once at Powerline Road 3550, follow this east for a short bit, turning left onto Rattlesnake Junction Road 3565. Take this northeast to get the full length of Josho’s. Take Josho’s as it heads south, then east and then north. At the end, you will have a choice of whether you want to continue on Ring Dike Trail or Rattlesnake Trail. Both are technical, but Ring Dike is more difficult and a bit longer. You will also have a little more climbing to do to get back to the next set of trails if you take Ring Dike. At the end of your trail of choice, head toward Top of Becks Rd 3535 and then head south on Rocky Ridge Trail. At the end of Rocky Ridge, head south on Broken Shovel, veering right onto Skyline Trail part way through. At the end of Skyline, a right turn on Powerline Road will take you back to Bambis. Alternatively, for a longer ride and different trail opportunities, you could take Powerline Road a bit further to Back In, returning to Bambi’s by traveling east on Outback Road 3575. Follow Bambi’s back to the trailhead. Admittedly, I don’t ride Signal Peak too terribly often. But, every time I do, it seems I “discover” something new. 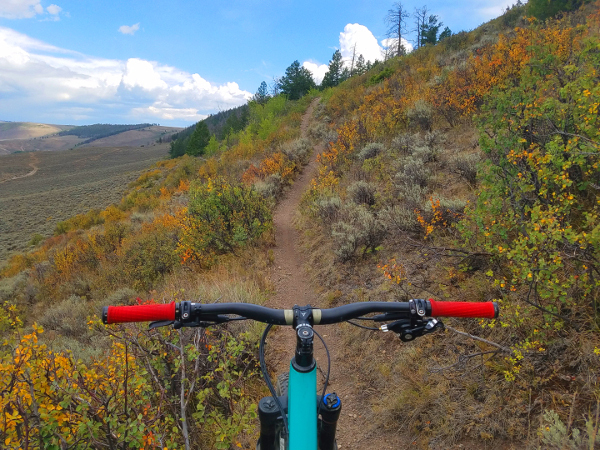 This has been happening more and more as Gunnison Trails has been working hard to add more trails to the system. I can’t wait to see how the network turns out when it is complete! Signal Peak can be ridden in a number of different ways, but my favorite one involves a counterclockwise loop. I typically park on Western Colorado University’s campus near the athletic fields and hop on to the Lower Ditchline Trail. This fast-going gravel recreation path travels along a few wetland areas until it reaches the Contour Trail (alternatively, you could also hop onto the Contour Trail just above campus for a longer and more singletrack-style ride). I then follow the Contour Trail north, eventually meeting up with the 4WD Signal Peak Road 3122. I climb this road until it intersects with the Ridgeline Trail, which is actually a steep ATV-style road, though motorized vehicles are no longer allowed on it. At that point, look for a bit of currently unnamed singletrack that contours around the north side of Signal Peak (marked on the CBGTrails App). This will travel for a couple of miles and eventually end at an old road west of the Signal Peak summit. If you follow this road west, it will connect with the Ridgeline Trail, even though it does not appear to do so on the CBG Trails Map. You can even stop and scramble your way up to the Signal Peak summit along the way if you want! Eventually, you will descend your way back to the intersection with Signal Peak Road 3122 where you once were. Here, you can either climb and then descend the Ridgeline Trail, or look for a bit of unnamed singletrack that contours to the north of Ridgeline, and then crosses over to the south (both are marked on the CBGTrails Map). In my opinion, the singletrack is much more fun! 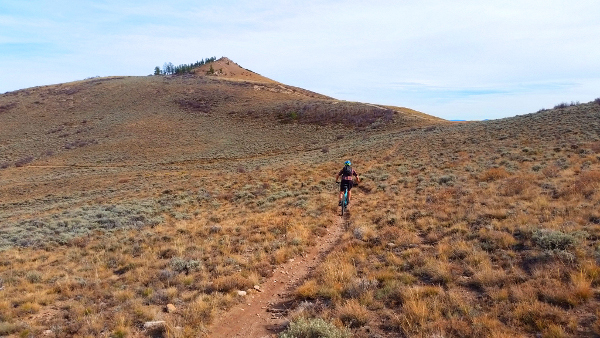 This singletrack will land you back on the Ridgeline Trail. You can follow the Ridgeline Trail to its end and make your way back to campus or you can follow one of a couple other bits of single track that head south and eventually meet up with the Contour Trail. Following the Contour Trail west will eventually lead you back to campus. With recent snow shutting down bike season in much of Crested Butte, now is the time when Gunnison shines. 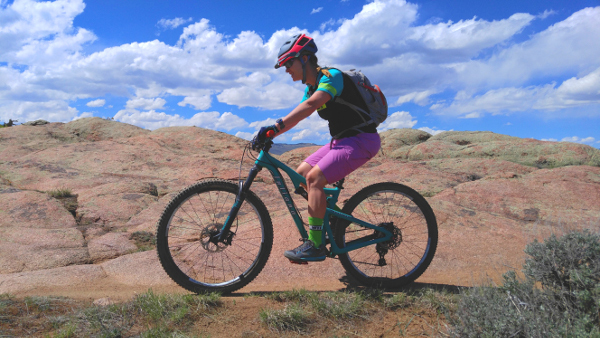 Plan your next mountain bike rides at Hartman Rocks and Signal Peak!